It's now possible in D.C. to have a robot deliver a hot meal to your door. Robots from the delivery company Starship Technologies are rolling along Washington streets as part of a pilot program, a company spokesman said. News4 spotted one of the robots — which look a little like a black-and-white version of the Pixar character Wall-E — cruising along M Street NW in Georgetown about 11:30 a.m. Tuesday. "This is the world's first delivery robot," Starship Technologies spokesman Henry Harris-Burland said. The robots that move as fast as 4 mph were created to deliver takeout food, groceries and packages. "Anything you can order online, it can deliver," Harris Burland said. 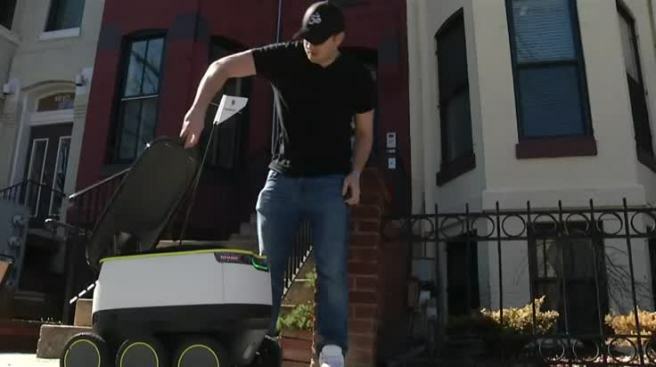 News4 spotted a food-delivery robot in action in Georgetown Wednesday morning. The robots are equipped with sensors designed to prevent them from running into things. They each have a red flag and flashing lights. The only sound they make is the mechanical whirring of their wheels. Starship Technology is working with Postmates, which lets users have food delivered from restaurants including Ted's Bulletin, &pizza and Fig & Olive. A limited number of customers in D.C. will receive a text message telling them a robot will deliver their meal. The user will be able to track the route of the robot. Then, a second text message will include a link to click that unlocks the top of the robot so the user can take the food. The Starship Technologies spokesman recommended that people who want to have a robot serve them sign up for Postmates. They will be notified if robot service becomes available in their area. "We are very, very early stage," Harris-Burland said.